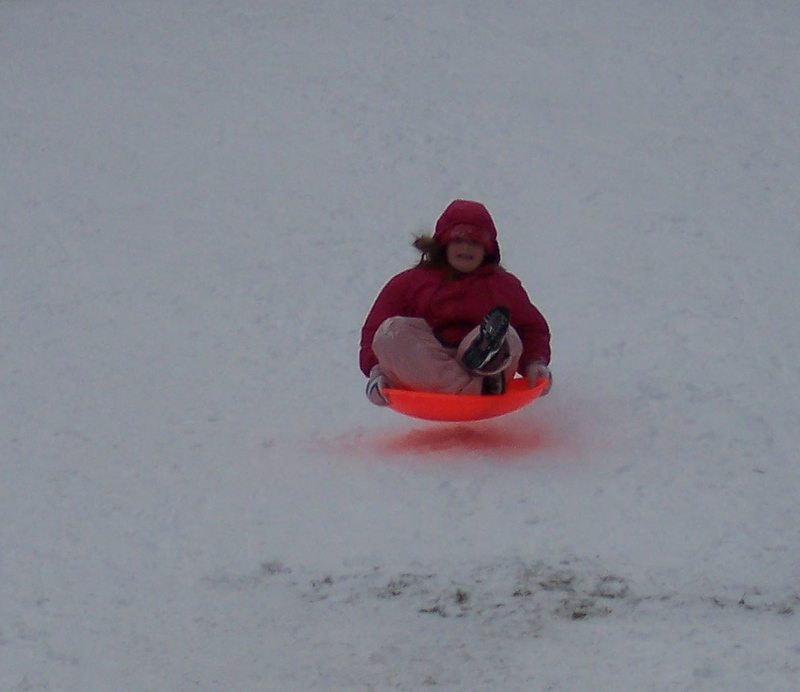 When I was a little girl, one of the best winter past times was tobogganing. I never got cold going up and down that hill. Mom and Dad took us to a special hill that seemed almost like a mountain: a hill with no name attached, a hill that I can no longer find, a hill where I could fly like the wind. Getting ready was the hard part: putting on woolen snow-pants and coats; scarves underneath and knitted hats and mittens. I sure was happy Mom put those strings on my mittens, ’cause I never had to worry about finding them; a mitten in each sleeve, just dangling there waiting for my hands. Somebody shoulda came up with something like that for hats. Hats were a lot harder to keep track of then mittens. Last, I pulled my rubber boots over my shoes and fastened the elastic string around the button at the side. Man-o-man, those boots were hard to get on. Sometimes, my foot went in crooked and the boot stuck, refusing to go on or pull off. The only thing worse than that was trying to help a Little Kid get his boots on, with his leg all dangly and useless; pointing when it should go straight, ankles all wobbly. Finally, everybody was ready. Mom even got baby Julie all bundled up so tight, she just looked like a bundle of blankets: first the receiving blanket all swaddled around tight. 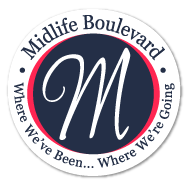 Then she wrapped one of those fuzzy blankets with the silky binding around tight, Julie in the middle and each corner folded up over her like an envelope. I loved that silky binding. I put an edge between my my toes at night and slipped my foot back and forth, just to feel that cool slipperiness. Anyways, Mom ended with a big quilt all around Julie. It’s a wonder Julie could even breathe, she was so far down in the blankets. All of us squeezed into the car; Dad driving and Julie bundled on Mom’s lap and some special person in the middle of the front seat; usually Deanna, ’cause she was oldest, but sometimes Loren-Dee-Dee-Bopper. I liked to sit in back and write my name in the frost covering the window. Bonita scootched up beside me and drew a face by my name. Dad yelled about that; he said I made the window dirty. I quick erased the whole thing with my hand, so I could see outside, which made Dad even madder. “Quit smearing up my windows.” he said. How could my clean fingers mess up the windows, anyhow? I thought he was making it up. I breathed hard so the window fogged up, and wrote my name again. Walking up the hill took forever and a day, compared to flying down. I loved that part, even when snow got in my face, which it always did if I got a running start and belly-flopped down on the sled. That was the best way to go, ’cause it built up the speed. I liked to eat snow, even if it gave me fallout poisoning from all the A-bomb leftovers in the air. Still, my face stung like the dickens when I got off my sled and faced into the wind. For some reason, there was always wind in winter. That’s why that song went, “Oh how the wind does blow, It stings the nose and bites the toes,” only my whole face stung, and pretty soon my toes hurt like they might crack right off. I kept quiet, ’cause I wanted to keep flying down on my sled. At least once, Nancy and Doug from across the road, came along with us. Doug was Bonita’s best friend. She loved Doug so much, the two of them rode down the hill together. Sometimes one sat beside the other, and wrapped their legs around, and sometimes one laid flat and the other got a running start and belly-flopped on top. They took turns, ’cause that’s how it was with friends, and besides that’s the polite thing to do, even if you’re not friends. One time, Bonita fell off the sled at the bottom of the hill and she started wailing and hollering like her legs got cut off. Doug just sat there looking at her, all wide-eyed and worried. I wasn’t the least bit worried, ’cause Bonita was always getting hurt and crying, even though she wanted to be tough. Partly that was because she was Dad’s best girl, and partly it was because she was a tinsy bit of a cry baby. Bonita cried and cried until we all had to leave the hill and sit around in Dr. Diekowitz’s super-hot waiting room. My snow pants got all soggy and the snow melted down into my boots and made my feet colder than when I was outside on the hill. My mittens felt heavy on the end of the string, and when I moved my arms, they plopped against my coat like wet sponges. All that wet wool started to smell like our dog, Nikki after it rained. Turned out Bonita had a broken collar bone. Dr. Diekowitz said both collar bones got broke before, probably when Bonita was born; this was the second time for her right collar bone. Bonita kept her arm in a sling until Dr. Diekowitz said it was healed. In the meantime, she moped around and could do next to nothing except look pouty. After that, her collar bone was always bothering Bonita; kinda like Tommy’s Chihuahua after Nikki bit him: Bonita arm hurt like crazy and hung loose and useless at the most unusual times: when she was supposed to fold clothes, or do dishes or some other chore that required her to use her arm, which is just about everything. That arm seemed to work just fine when she was outside playing. I was pretty sure Bonita’s collar bone was gonna take a lifetime to heal. First I got mad about that, and then I remembered how I was standing at the top of the hill, thinking she was just being a cry-baby and there she lay with a broken bone. I never had a broken bone or even a sprain. I guessed I was pretty darned lucky. Besides, I had a hard time staying mad at anybody, let alone my best-friend-sister. 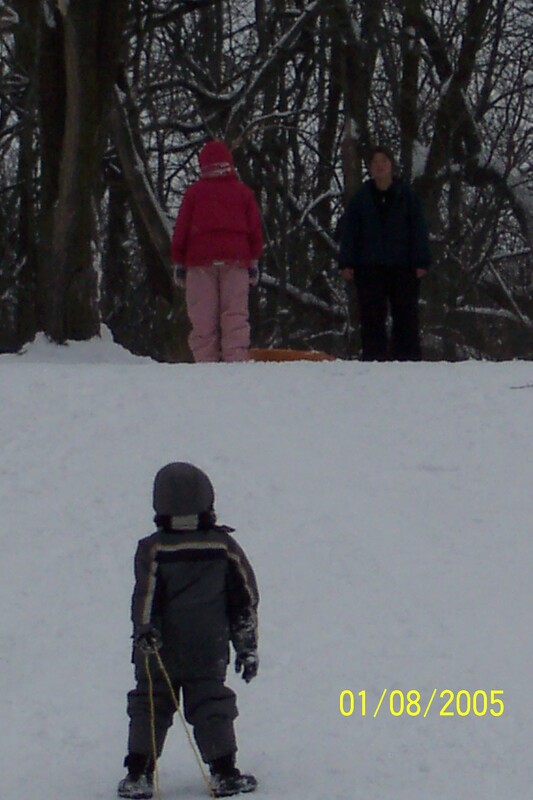 Today I live within walking distance from a sledding hill. The kids in the neighborhood built up a little ramp, so their boards and tubes and saucers can go flying over. I fly down a few times each year, when nobody but G-Money is there to see. Mostly I stay home with the grandkids who are too young to fly, and we make hot chocolate and build a fire in the fireplace waiting for the sledders of the family to come in from the cold. So far, no broken bones, although one of my sons almost went head over heels running down the hill after his daughter, when she went over that ramp by accident. Another generation of fliers hits the hills. I’m uncertain whether Bonita’s collar bone ever did heal entirely. I believe it still pains her from time to time. I am a little jealous of your ability to evoke sympathy.